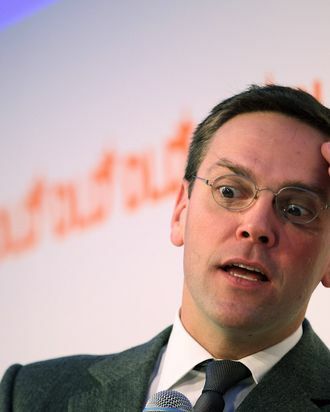 British authorities investigating phone hacking at News Corp. have just found out that ex–News International chairman James Murdoch and three other execs have kept “secret” second cell phones for about three years. Rupert’s boy, in particular, is said to have specifically requested a “white iPhone” to go along with his company BlackBerry. The standard black seems more subtle, but there is no accounting for taste, even in potentially shady dealings.